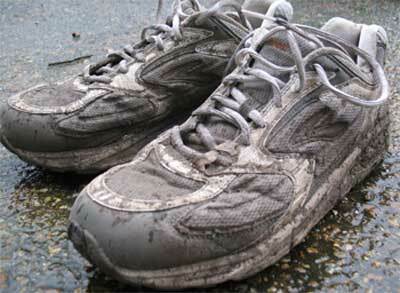 It’s time to retire my old Brooks running shoes. While they’ve been great I’ve probably done too many miles in them and need to find a replacement. They’re a hefty, older style motion control shoe and I was fitted by the someone watching me run down the road to asses my gait! They were fairly accurate in their assessment though and the Brooks served me well when I had weak muscles and a sloppy running style (it’s still sloppy but not as bad). At one point I was going to ditch the Brooks motion control shoe and switch to a neutral shoe with some custom orthotics. I had the orthotics made and wore them for a while in my regular shoes but just couldn’t get used to them. I ended up sticking with the Brooks and working on strengthening exercises and now I can go for miles without any plantar fasciitis and only a touch of ITB pain. Unfortunately these have now been replaced by achilles tendinitis so I’ve got something else fix. I don’t think it had anything to do with the shoes though. The grip on the Brooks has been good and I’ve only fallen a couple of times on slimy mud covering concrete. They’ve be great on wet pavements and can even cope with mud if your careful. It takes quite a deep puddle or 30 minutes sloshing through mud before my feet start to get wet as the upper is not heavily ventilated. This makes them a bit warmer which is nice during winter but not so good in a hot summer. Although Brooks are known for being fairly wide I’ve got quite narrow feet but they fit me really well. I’ll definitely be trying on Brooks today when I look for a replacement, although hopefully I’ll need a bit less motion control.